Does your Fluke 179 have a loose kickstand (tilt stand, tilting bail) that pops out whenever you try to prop it up for use on the workbench? Blog reader LDSisHere from over at badcaps.net contacted me with this problem, and together we came up with this solution. So the following is a new feature on this website, a reader-contributed repair! This problem can happen on any of Fluke’s “tapered” style meters, including the 175, 177, 179, 77-IV, and also most of the 7x-III series as well. 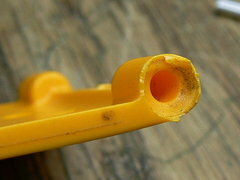 It happens when the plastic crumbles around the joint that forms the hinge where it is supposed to be firmly snapped in place. The broken edge of the convex “cup” joint allows the kickstand to pop out. A simple glue repair is not going to fix this. The cups are supposed to snap onto these raised dimples, which are still OK.
Find some 3/32″ music wire or steel pins and cut two pieces about 1/2″ long. These will be the new hinge pins. Use a rotary tool and select a drill bit that will allow for a snug fit of the pins. Using the pre-existing holes inside the cups as a guide, drill through them deep enough so that the pins are able to go all the way in and sit flush with the edge of the kickstand. The shape tends to deflect the drill bit, so be sure to hold/clamp the workpiece firmly. Mark the a center point on the dimples with something sharp. It needs to be deep enough to keep the drill bit from wandering in the next step. Drill a hole into the center of the dimple on each side. This will be a best-effort exercise, because you can’t drill straight in. If you have one of those Dremel handpieces on a flexible shaft, now might be the time to use it. Using a pin-vise and drilling by hand is also a good option. There’s not a lot of material here, so be careful not to make the holes too big. Make sure the new hinge pins are fully pushed in and put the kickstand in place. Now push the pins back out and into the holes you made in the dimples. Put a dab of epoxy or CA-type glue on the pins to lock them down. Be careful not to allow the glue to run into the new hinge joint and set up, preventing it from rotating. If you’re using CA glue, the gel type is best, it doesn’t run. But it will still glue your fingers together splendidly. The kickstand still fits well and the repair is not even obvious to the casual observer. Put your meter back in service without it falling over! Thanks LDS, for executing the repair and providing the pictures! This entry was posted in How-To, Reader-contributed, Repair and tagged 170-series, DMM, Fluke. Bookmark the permalink. Actually im quite supprised that fluke didnt do it that way considering the price of there units. When i saw the stand cup hole i thought “Welding rod” i allways name things wrongly ha ha 🙂 , so i was on the same page as the repairer :), if there was clearance inside the meter to insert the pins i would not have drilled fully through the stand, i would leave the holes blind. I like the blind hole idea and the spring, although it would require a fair bit of precision. As a secondary thought, you could still do it using a blind hole, just drop a small spring in the stand holes and compress with the pins, like the sprung pins that hold watch straps on to the watch. I want to report that this repair job is holding up very well so far. The repaired meter is the meter that I use the most often so it has seen a decent amount of action. I actually think that the kick stand is better now than it would have been new from the factory. As far as the aesthetics go it probably could be a little better but I was not sure how well it was going to work when I did it originally, so I wanted to be able to remove the pins if I needed to undo/redo the repair. As it is, you still have to go looking for the repair to actually see it. Thanks for the update and helping me to document this repair.